As becca wrote about a few weeks ago, sometimes our skin problems are because of our products, not our skin. After years of using over-drying or hyper-oily products, I've begun moving toward skin care products with more natural ingredients*. 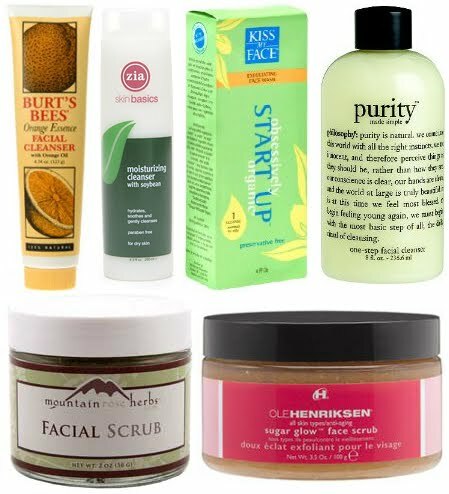 There are lots of books and websites with recipes for making your own natural face wash or scrub, but honestly I don't have the time for it. If I can't throw it on my face immediately when I stagger into the bathroom, my face isn't getting washed. (Gross, I know.) Lately, I'm in love with the ease of Yes to Cucumber! Face Cleanser Towelettes. They have a light, clean scent and feel like I'm washing with invigorating spring water. Even my husband likes them. 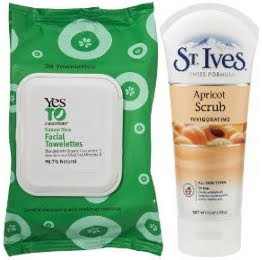 But wipes don't get the down and dirty, so once a week I use St. Ives Apricot Scrub. It leaves my skin fresh and glowing. At $5 and $3 respectively, these two products provide a great and inexpensive natural face routine. *More natural, less chemicals. I'm not necessarily looking for chemical free, vegan or organic products. Just wanted to say that the Burts Bees Orange Cleanser smells divine! It's such a cool... orange smell! But somehow reminds me of the candy Dots (in a very good way). I highly recommend!